If keeping multiple dishes hot between the time they are prepared and placed on the dining room table is a challenge, then it may be worth your while to install a warming drawer in your kitchen. With temperatures plunging this winter, we’ve had quite a few customers ask about the features of warming drawers. Warming drawers are separate cooking devices that use a low-heat setting to ensure that your dishes stay heated and ready to eat, no matter when you made them. They can also heat up plates and even proof bread dough – the final step before baking. Warming drawers are typically installed with an accompanying wall oven, but they can also be installed on their own. Best of all, their built-in capability means warming drawers can blend seamlessly into your existing kitchen cabinet, so you don’t have to worry about any clunky metal devices adding clutter to your spotless cooking space. Most models also hide the control panel behind the front cover, and can be custom-designed so they match your cabinets and countertops. If you’re still not convinced that you need an additional heating appliance in your kitchen because you already have a microwave or toaster oven, consider these following reasons why a warming drawer may be the ultimate cooking tool for your lifestyle. Why not a microwave or toaster oven? Chances are you’re asking yourself, “Why buy a warming drawer when I have a toaster oven?” While portable heating devices like toaster ovens and microwaves are great when your meal needs a quick warm fix, they do have some notable disadvantages. One of the biggest turn-offs of the microwave is how much it alters your fare. Microwaves reduce the nutrient foliate in your food, which means you won’t be getting the essential vitamins and minerals that you need. For example, a microwave can lower the amount of vitamin B12 by 30 to 40 percent. By the time you finally heat up your dish, you may not have any nutrients left. Although toaster ovens do not zap all the health-boosting minerals and vitamins from food, they do have some downsides. While they take up less space than most household appliances, toaster ovens can only heat up a small amount of food at a time, so if you have many mouths to feed, you’ll be keeping them waiting. Toaster ovens also use less heat than microwaves and traditional ovens, which means that they’re energy efficient yet most likely will not be able to heat your dishes as well. If you and your family have an on-the-go lifestyle, it may be difficult to find a time when you can have a sit-down meal together. Fortunately, the warming drawer makes it possible for families to have fresh meals despite their busy schedules. All you have to do is place the plate into the drawer and you’ll have a hot, tasty dish in no time. 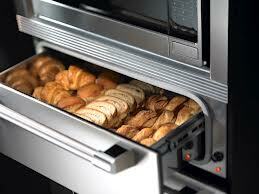 Most warming drawers are equipped with a moist setting, which gives the food its “just cooked” taste and appearance. Fried food can also be re-heated by using the crisp setting, ensuring that no French fry will be left soft and soggy. Plus, warming drawers do not drain vital nutrients out of the food, so you know you’ll be getting all your important vitamins for the day. The temperature levels on a warming drawer typically cap out at 200 degrees Fahrenheit, which is enough to keep any dish heated between meetings and after-school activities. Because most warming drawers are between 27 and 30 inches wide, they are large enough to fit six full-size dinner plates of food – perfect for those family holidays where your guests just can’t help themselves to having second and thirds.